Created by Hans Ippisch who was interviewed in an old magazine. A question posed to him was about any unfinished projects which were gathering dust. His reply was that he had started on a game called “Dragon Slayer”, which only one level was ever almost finished. The game was in fact to be a title released by Linel on the Amiga mainly, but seems a port for the C64 was also unofficially on the cards too. The game was mentioned in various magazines, and Games Machine had a Amiga shot, which we’ve included here. In this level, you can fight against a giant dragon in high resolution graphics. Graphically impressive, you couldn’t really do much apart from stare at the animations for a few seconds. Thanks to contributor Akkroid, we learn from a snippet in The Games Machine, that the title would be a sort of Psygnosis Barbarian type of game with very large characters wandering around rooms. We learn more of the story – which tells of a wicked dragon that terrorises a remote village – each year the villagers have to sacrifice a virgin to the beast in order to protect themselves. The only way to stop the dragon’s reign is for one particularly brave adventurer to locate the shattered segments of a medallion, access the dragon’s lair and wipe it out. The game would feature hundreds of locations in villages, forest and the castle (which itself would have 300 rooms). Sadly it was never to be though! 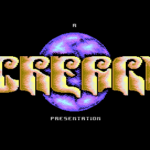 This C64 version was spread as a demo by the programmer and is all what remains of this game. No extras or additional bits exist, unless Hans Ippisch can confirm otherwise? Promising preview, never off the start line… What happened to the title from Linel which seemed to promise so much? 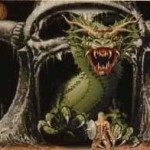 The Dragon’s design is very similar to one who later appeared in Rings of Medusa Gold for Amiga and PC. This directory contains 5 magscans (French) about this game. Brilliant, thanks Dave – though this requires a username + password? There was a mention of this game in TGM #11 October 88 pages 15 & 16 in the Linel roundup of upcoming games. The screen shot (page 16) in this issue is different to the one you have in the gallery, I suppose it reminds a little of Psygnosis Barbarian. The article mentions ST and Amiga versions, and also gives some notes about the gfx and game plot. Thanks Akkroid! Updated the page now with plot and added scan!